 At the time of Adams's death in 1988, he had almost completed this book, which recounts his side of a major controversy regarding Vietnam in measured fashion and affords instructive insights into the lot of a lower-echelon operative in the spook trade. An intelligence analyst for the CIA from 1963 to 1973, Adams gained a modicum of fame (or notoriety) in the early 1980s as the principal source for a CBS TV documentary entitled The Uncounted Enemy, which exposed intelligence failures in the Vietnam War. General William Westmoreland sued for libel, and although the widely publicized case never reached a jury, trial disclosures supported claims long made by Adams. Under terms of a flexible roving brief, he had in the 1960s made himself the CIA's resident expert on the Vietcong's order of battle. On the evidence of captured documents and data gathered during frequent field trips to combat zones, it soon became evident to Adams that the US military was deliberately underestimating the VC's troop strength. In the face of political opposition, the CIA failed to defend his findings; the Pentagon figures were accepted by President Johnson, who was eager to reassure the electorate that an unpopular war was going well. Early in 1968, the unacknowledged cadres went into action with VC regulars during the Tet offensive, which turned the tide of the war and destroyed LBJ's re-election bid. Although Adams had been proved right in his calculations, he remained a prophet without honor in a government bureaucracy willing to accommodate its political masters; ultimately he quit the agency. 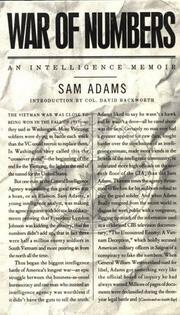 In this tellingly detailed and evenhanded account of how vital intelligence may be collected, collated, interpreted, and ultimately ignored, Adams (who never opposed America's involvement in Vietnam) leaves yet another reproachful monument to a conflict in which truth was a constant casualty. David Hackworth, the retired Army colonel who wrote About Face (not reviewed), provides the volume's introduction.